Thailand is the Land of Smile. In my opinion, it is also the Land of Advertisements. 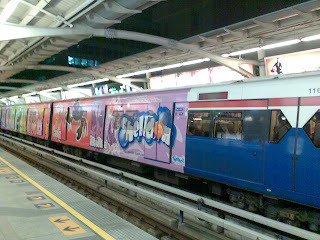 Advertisements are everywhere in Bangkokians’ daily life. The usual ones like adverts on metro or subway trains, buses, tv, etc. But there are some unexpected ones that pop into my sight once in a while. Let’s read further for some interesting ones that I have seen. 1. Colgate adverts on disposable coffee cup. 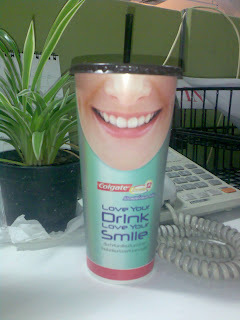 Instead of having a logo of a local café, Colgate advert take over the cover of the paper cups. You can’t avoid it when you sip your coffee. 3. This is also a good idea. Advert in the taxi cab! I got on this cab one time, I saw a small laminated advert card of various mint and chewing gums at the back of the headrest in front of me. 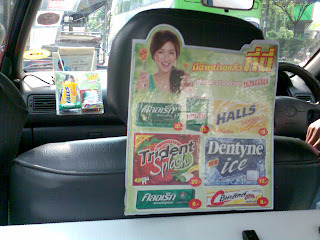 Then my colleague who was with me in the cab told me that the cab driver is actually selling the gums as well! I thought it is a good way to advertise as we all know Bangkok traffic is bad. A short trip could end up a long one. So, why not buy a pack of gum, and just chill in the cab while the taxi driver brings you to your destination? 4. On TV, you can see a display of a LCD TV with big logo. Also, you will see display of a laptop in front of the desk. You can't avoid adverts even you are watching the news. I am sure there are some more clever ideas that I have not discovered yet. But just these are some interesting ones that I encountered. 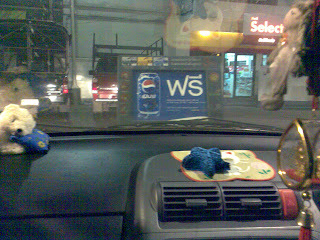 Hey all these sounds interesting, why not take pix of all these adverts. I do like the tvc in Thailand, very interesting and it's much better then Malaysia ones. I guess it's probably the limitations that the government has given.